Thanks for making such brilliant music.Your guitar playing really inspires me. 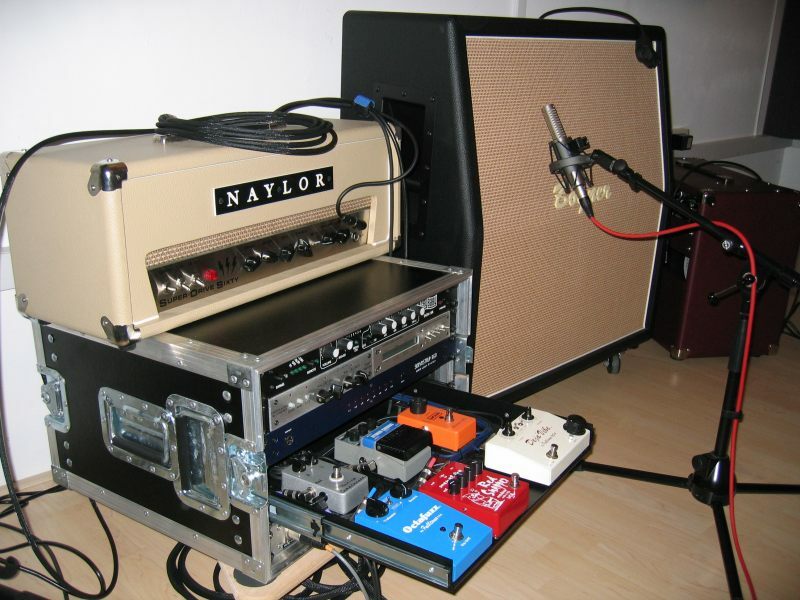 Are you still using Naylor amps? Do you use any effects? Thanks for writing. I still have my 38-watt super club 38 Naylor amp, but I’m now using Sewell Amps. Doug Sewell makes these great handmade amps in Texas. It’s a 50-watt Texaplex with a 12″ 50-watt Weber Blue Dog ceramic speaker. It’s got a solid state rectifier but you can substitute a rectifier tube at any time, as they each plug into a tube socket. I don’t use effects between the guitar and amp, but the engineer in the studio will put some delay and reverb on afterwards. You lose some of the tone when you use pedals, but most players like the different colors you get with them. My sound is just raw, and losing any millivolts from the guitar takes away from that. I use George L’s cables which sounded the best when I started using them 10 years ago, but there are supposedly some better ones now which I’d like to try. Thanks for your questions, I think I’ll add a new page on my site so others can see the answers. You’re from Australia I see from your email address. I toured there in ’97 and ’98 and I would love to get back there. I’m glad you like my music, where did you first hear it? I really like both the Naylor and the Sewell, and use them equally. I had a 1972 Altec 417 8C reconed and use it in the Sewell. The Naylor still uses the original 100 watt Naylor speaker that Kyle Kurtz from Naylor made for me. As for effects on live gigs, I still use no effects between the guitar and amp, but use a Boss DL6 Digital Delay pedal after the Shure SM57 micing my amp. The SM57 goes into a Jensen “Low to High” transformer, then into the Delay; then out of the delay into a Jensen “High to Low” transformer into the PA. When I do sessions, I sometimes use an old MXR Dynacomp, General Guitar Gadgets MBB (Marshall Blues Breaker) overdrive kit, Morley power Wah Fuzz, Morley Autowah, and a Garagetone tremolo. I also use a Planet Waves Mini Headstock tuner, and it’s probably the handiest gadget I ever bought! Got a good-sounding Liquid Tremolo from Guitarfetish.com.